Not every day in fishing boat engineering is a good day. When an engineer working a shift at a factory has a bad day, he goes home at the end of the shift and grabs a nice cold one. When a boat engineer has a bad day, the shift seems to never end and home is a place that takes days to get to and money for refreshments requires fish in the hold to pay for them. With that in mind I hope this fishing vessel engineering article series helps some of you to make it back to the dock with enough cash to pursue whatever makes you happy. Today’s disaster is the premature mechanical failure of electrical motor bearings which modern fishing vessels have more of every year. Since the failure you are about to read and see pictures of was caused primarily by a lack of lubrication, it does reflect poorly on me as an engineer. Allow me to explain. When it comes to the deck machinery I have always been enthusiastic about greasing. The (relatively) slow turning bearings require lots of lubrication due to the hard service life of deck mounted equipment. Constant immersion and spray with salt water, shock loading from the rolling motion and strain, and the rapidly changing temperatures create conditions where proper lubrication at all times is a must and over-lubrication is almost impossible (and easy to see due to the mess it makes). So when it comes time to grease the deck gear I put on music and go to town. 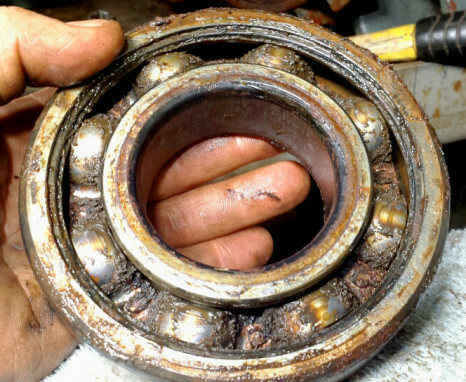 Since the most common causes of failure in deck mounted bearings are lack of lubrication and contamination (Often introduced during greasing) be sure to use plenty of grease, wipe the fittings before you grease them, and replace the worn or broken ones to ensure that contaminants (Rust, fish goo, etc.) aren’t pushed into the bearings when you grease them. Electrical motors with bearings mounted right next to high voltage copper windings that get hot enough to cause grease to liquify and run are something I have always been much more reluctant to grease. Over lubricating the electric motors is very likely to cause them to fail (and possibly catch fire). The copper windings in the motor are coated with a varnish that when contaminated and saturated by a greasy film will burn like a roman candle. The worst part of having one motor fail in this fashion is the possibility that all of them will fail due to the fact that they were all on the same over-lubrication schedule. Electric motors that run cool or warm need lubrication once a year and ones that run hot (uncomfortable to the touch) need lubrication 2 to 3 times a year. When greasing them do it sparingly just a couple of pumps for the small motors and a little more for larger ones. Let’s take a look at the bearing I missed…. 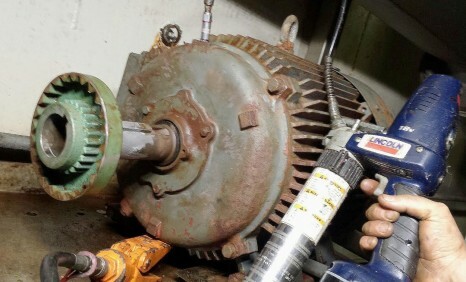 This fifty horse power electrical motor drives a fish pump that is only used when pumping fish or water from the fish holds of the boat (Very infrequent use) yet after only 7 years of service the bearings had become noisy and the sound of their distress was increasing in volume with every use (A very bad sign). In the image above the coupling has been removed, and the end cap removed and set down grease side facing you. A first look at this open style bearing says it all. The bearing cavity (where the balls roll) is empty of grease and lots of rust and contaminanation can be seen on the cage and in the bearing. The grease in the bearing cap is hard and dirty. 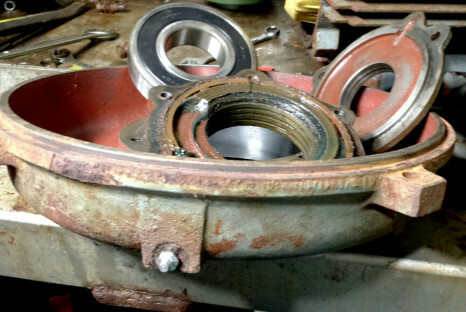 This bearing failed prematurely due to lack of lubrication and contamination. 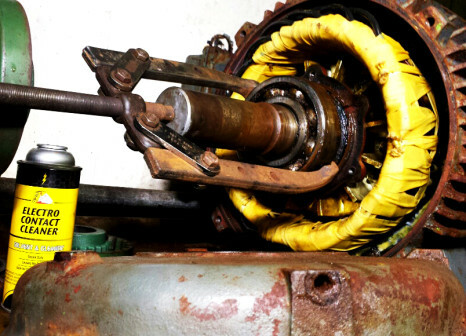 In this image I have removed the end of the motor and the stator winding (yellow) can be seen. 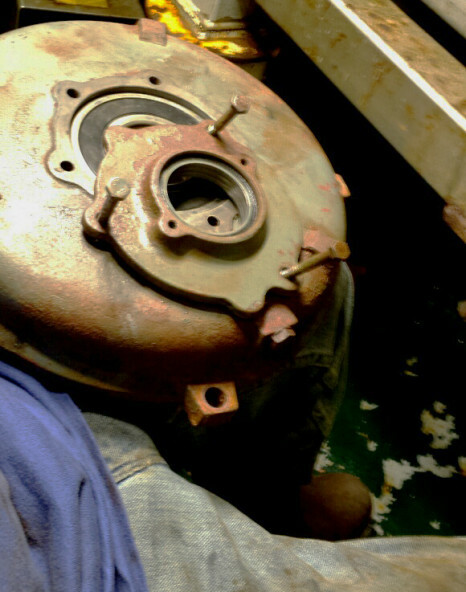 A bearing puller is being used to remove the old bearing from the shaft of the motor. Cleaning everything with elecrical contact cleaner is important in this procedure to keep any dirt, grease, or moisture out of the motor. At the bottom of the image you can see the hole in the end plate where the grease fitting was supposed to be installed. There is lots of rust in the grease hole and it will have to be cleaned before a new grease fitting can be threaded in. This bearing had very little time left. It is possible that greasing it would have quieted it for a time, but the dirt and rust inside weren’t going anywhere and the damage was done. 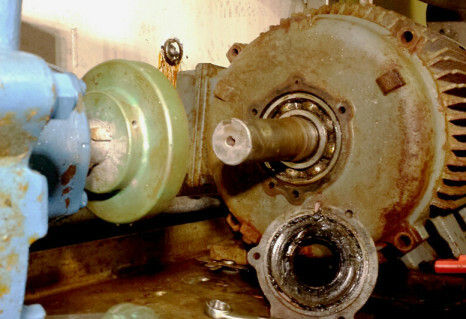 Bearing failure is an accelerating process and allowing an electric motor bearing to fail completely usually results in the destruction of the machine. If the rotor (shaft) that the bearings support is allowed to touch and drag on the stator (outer copper winding) the motor windings will be destroyed (and probably burn for a while). Here you can see the end of the motor with new grease fitting installed (bottom of image slightly left). Notice the old grease I left for the purpose of viewing (center of image). The grease got so hard it actually cracked. Besides that everything else is clean and the new bearing is ready to install. Here I am assembling the bearing caps. I have elected to leave the bearing seals in place because I assess that they will help for this application. (The Chinese factory that made this motor had profit margins to worry about when they chose this design). I am assembling the bearing components in my lap supporting the bearing with my left hand. The motor is all back together in this image and ready to go. As you can see I have a big grease gun with lot’s of stamina (At 18 volts it will go through 6 tubes of grease on a single charge) and I am not afraid to use it. Proper installation and alignment is important for the life of bearings and couplings. One of the best ways to perform that is with the tool you see here. The right dial indicates orbital alignment and the left dial indicates facial alignment. With a proper alignment and a good lubrication schedule this machine should run with no problems for many years. The following statistics are largely from land based applications and as such are slightly different from what will be true in the marine environment. 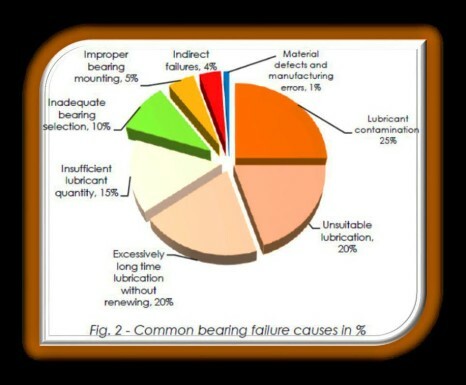 The graph above shows the most common bearing failures (from forensic analasys of failed bearings). The results of these studies really show the importance of proper lubrication for the life of bearings as 4 out of 5 bearings fail due to the lack of it. 1 in 4 bearings fail due to contaminants in the lubricant making it the leading cause, closely followed by lack of lubricant quality, quantity, and renewal. 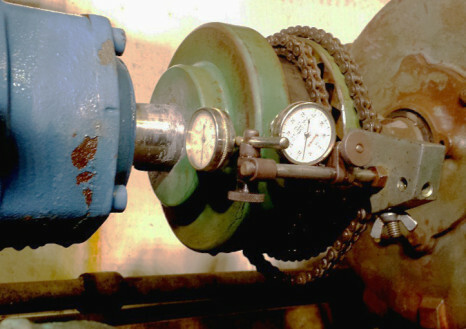 Poor bearing selection, design, installation, alignment, and other indirect failures all account for a mere 20 percent of all bearing failures. I can’t possibly tell you how much I appreciate reader feed back and discussion so any comments are welcome and I will happily respond to questions. So until next month I wish you all good fishing, fair winds, and blue skies.